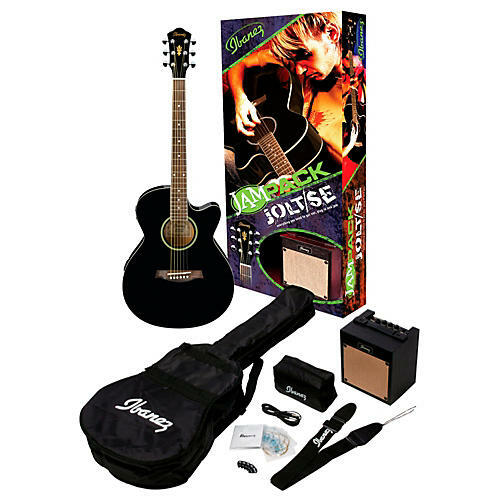 The Ibanez JamPack Jolt gives you a complete plug 'n' play setup, starting with the Ibanez AEG5EBK acoustic-electric cutaway guitar with on-board preamp and tuner, the ACA15 Amp, and all the guitar accessories that you need. The guitar's AEQ200T 2-band EQ is optimized for use with Ibanez under-saddle pickups. The on-board tuner with 7-segment LED lets you get in tune fast. The JamPack also includes a padded gig bag, guitar cable, strap, instructional DVD, extra strings and picks.